The physical condition of the environment in which space activities take place must be conducive to the safe and sustainable development and implementation of all space operations. Rapidly increasing debris in space is posing serious risks to space activities of all nations. Such risks are real, as evidenced by an unprecedented collision between a defunct Russian satellite weighing about 900 kg (Cosmos 2251) and an active about 500 kg U.S. commercial satellite (Iridium 33). The theory of “big sky” or “vastness of space” is being questioned as space operators face new challenges primarily due to the enhanced risks posed by an ever increasing number of space debris, particularly in the region of space that is being used extensively for meeting important earthly needs, like communications, Earth observation, weather forecasting, reconnaissance, navigation and global positioning services, early warning, etc. The availability and risk-free utilisation of space is becoming difficult. The accident seems to have sounded a wakeup call for all countries, especially the space-faring nations and the States having an interest in the exploration and use of space. From that perspective, this paper addresses some relevant questions associated with the legal and policy aspects of the Iridium- Cosmos collision. Specifically discussed are the issues concerning possible liability of the States directly involved in the collision under currently applicable international law; the general space environment; added risks and costs due to the debris created by the collision; and, finally, the concerns of space operators and some governments and the efforts they are making to achieve and maintain safe and sustainable development and use of space. Undoubtedly, these issues are highly complex. However they are discussed here in a general fashion and no attempt is made to carry out a thorough critical analysis in this paper. According to Article VI of the Outer Space Treaty, States bear international responsibility for national activities in outer space, whether such activities are carried on by their governmental agencies or by non-governmental (private) entities, and for assuring that their national activities are carried out in conformity with the provisions set forth in the Treaty. The activities of non-governmental entities require authorisation and continuing supervision by the appropriate State. NASA National Space Science Data Centre, an official entity of the U.S. Government, enlists Iridium LLC of the United States as the funding agency of Iridium 33 satellite: see NASA National Space Science Data Centre. 2 Nov. 2009. http://nssdc.gsfc.nasa.gov/nmc/spacecraftDisplay.do?id=1997-051C. NASA National Space Science Data Centre. 2 Nov. 2009. http://nssdc.gsfc.nasa.gov/nmc/spacecraftOrbit.do?id=1997-051C. On 4 March 1998, Russia informed the UN that “On 14 September 1997, seven Iridium satellites were placed in Earth orbit by a single Proton carrier rocket from the Baikonur launch site. [... ] The satellites are owned and operated by the Motorola company (United States of America)”. See: Information Furnished In Conformity With The Convention On Registration Of Objects Launched Into Outer Space. “Note verbale dated 4 March 1998 from the Permanent Mission of the Russian Federation to the United Nations addressed to the Secretary-General”. UN Doc. ST/SG/SER.E/332 of 19 March 1998. Vienna: United Nations. “Communications Act of 1934”. Federal Communications Commission. 3 Nov. 2009. http://www.fcc.gov/Reports/1934new.pdf. Also applicable are the U.S. Code of Federal Regulations: Title 47-Telecommunication; Chapter I-Federal Communications Commission; Part 25-Satellite Communications. The official U.S. Registry of Space Objects Launched into Outer Space, which is maintained by the U.S. Department of State’s Bureau of Oceans and International Environmental and Scientific Affairs, enlists Iridium 33 (with International Code 1997-051C and NORAD 24946), for which the USA is the flag state and affirms that the satellite was not registered with the UN by the U.S. See: U.S. Space Objects Registry. 2 Nov. 2009. http://usspaceobjectsregistry.state.gov/registry/dsp_DetailView. cfm?id=1517. Similarly, the SPACEWARN Bulletin Number 527 substantiates that Iridium 33 was an American communications spacecraft that was launched with a Russian Proton-K rocket. See: “SPACEWARN Bulletin Number 527”. 1 October 1997. NASA National Space Science Data Centre. 2 Nov. 2009. http://nssdc.gsfc.nasa.gov/spacewarn/spx527.html. NASA National Space Science Data Centre. 2 Nov. 2009. http://nssdc.gsfc.nasa.gov/nmc/spacecraftDisplay.do?id=1997-051C. For example, see U.S. Government Orbital Debris Mitigation Standard Practices. 2 Nov. 2009. http://www.orbitaldebris.jsc.nasa.gov/library/USG_OD_Standard_Practices.pdf. White, Jeffrey. “Iridium Satellite: Aviation — We are everywhere you want to fly”. 5 Nov. 2009. http://www.eurocontrol.int/nexsat/gallery/content/public/Steering%20Group/Meeting10/IRI-DIUM_JeffWhitePresentation32109.pdf. “Vacuum in Space”. 16 Feb. 2009. International Herald Tribune. http://www.iht.com/articles/2009/02/16/opinion/edspace.php. “Committee Examines Ways to Make the Space Environment Safer for Civil and Commercial Users”. 28 Apr. 2009. Press Release from the Committee on Science and Technology of the U.S. House of Representatives. 23 Sept. 2009. http://science.house.gov/press/PRArticle.aspx?NewsID=2447. Stump, Adam M. “Satellite Collision Debris May Affect Space Operations, Cartwright Says”. 12 Feb. 2009. American Forces Press Service. 19 Feb. 2009. http://www.defenselink.mil/news/newsarticle.aspx?id=53077. Shalal-Esa, Andrea. “Pentagon May Reach Satellite Analysis Goal Early”. 28 Apr. 2009. Reuters. 2 Nov. 2009. http://www.reuters.com/article/idUSN2836780620090428. “Global Space Economy Revenues Reach 257 bln in 2008: Report”. 31 Mar. 2009. Chinaview. 2 Aug. 2009. http://news.xinhuanet.com/english/2009-03/31/content_11106035.htm. “Space Debris-Problem Solved”. 31 Aug. 2009. Space Daily. 30 Aug. 2009. http://www.spacedaily.com/reports/Space_Debris_Problem_Solved_999.html. Moskowitz, Clara. “U.S. ‘Decades Behind’ on Space Debris Threat, Official Says”. 6 Nov. 2009. Space.com. 8 Nov. 2009. http://www.space.com/missionlaunches/091106-space-junk-risk-increase.html. “Space Debris: A Growing Challenge”. Oct. 2009. Aerospace America. 2 Nov. 2009. http://www.gsb.stanford.edu/news/packages/2009/PDF/AIAA-SpaceDebris_OCT2009.pdf: 31. “Astronomy Question Of The Week: Is Space Debris Dangerous”. 25 Aug. 2009. Spacemart. 25 Aug. 2009. http://www.spacemart.com/reports/Astronomy_Question_Of_The_Week_Is_Space_Debris_Dangerous_999.html. “Space Debris Poses Risk”. 3 Aug. 2009. The Times & Transcript. 3 Aug. 2009. http://timestranscript.canadaeast.com/newstoday/article/748848. Glassman, Albert. “The Growing Threat of Space Debris”. July 2009. Todaysengineers. 2 Nov. 2009. http://www.todaysengineer.org/2009/jul/space_debris.asp. “Committee Examines Ways to Make the Space Environment Safer for Civil and Commercial Users”. 28 Apr. 2009. Press Release from the Committee on Science and Technology of the U.S. House of Representatives. 23 Sept. 2009. http://science.house.gov/press/PRArticle.aspx?NewsID=2447. Thomas, Brad. “STS 121”. Apr. 2006. Space Center Roundup, Lyndon B. Johnson Space Center. 9 Nov. 2009. http://www.jsc.nasa.gov/roundup/online/2006/0406_p8_11.pdf: 8. Lovgren, Stefan. “Space Junk Cleanup Needed, NASA Experts Warn”. 19 Jan. 2006. National Geographic News. 19 Feb. 2009. http://news.nationalgeographic.com/news/2006/01/0119_060119_space_junk.html. Wright, David. “Colliding Satellites: Consequences and Implications”. 26 Feb. 2009. Union of Concerned Scientists. 11 Oct. 2009. http://www.ucsusa.org/assets/documents/nwgs/SatelliteCollision-2-12-09.pdf. Swaine, Jon. and Stephen Adams, “Experts Warn of More Space Crashes After U.S. and Russian Satellites Collide: Space Scientists Issued a Stark Warning Yesterday Over the “Inevitable” Prospect of More Satellites Crashing into Each Other”. 12 Feb. 2009. The Telegraph. 15 Mar. 2009. http://www.telegraph.co.uk/science/space/4603851/Experts-warn-of-more-space-crashes-after-US-and-Russian-satellites-collide.html. Moskowitz, Clara. “U.S. ‘Decades Behind’ on Space Debris Threat, Official Says”. 6 Nov. 2009. Space, com. 8 Nov. 2009. http://www.space.com/missionlaunches/091106-space-junk-risk-increase.html. It has recently been reported that several nuclear-powered manned spacecrafts might be launched soon both by NASA and Russia. See: “Russia Goes All Out To Develop Nuclear-Powered Spacecraft”. 16 Nov. 2009. Space Travel. 16 Nov. 2009. http://www.space-travel.com/reports/Russia_Goes_All_Out_To_Develop_Nuclear_Powered_Spacecraft_999.html; Kislyakov, Andrei. “Old Russian Nuclear Satellite Returns”. 30 Jan. 2009. Spacedaily. 2 Nov. 2009. http://www.spacedaily.com/reports/ Old_Russian_Nuclear_Satellite_Returns_999.html; Isachenkov, Vladimir. “Russia Hopes Nuclear Ship Will Fly Humans to Mars”. 29 Oct. 2009. Associated Press. 2 Nov. 2009. http://www.google. com/hostednews/ap/article/ALeqM5jfhjVbCZfHYXlG0zJNKwYr8BtNqgD9BKPDOO0. “China Confirms Satellite Downed”. 23 Jan. 2007. BBCnews. 2 Nov. 2009. http://news.bbc.co.uk/2/hi/asia-pacific/6289519.stm. Morring, Jr., Frank. “China Asat Test Called Worst Single Debris Event Ever”. 11 Feb. 2007. Aviation Week & Space Technology. 10 Mar. 2007. http://www.aviationweek.com/aw/generic/story_generic.jsp?channel=awst&id=news/aw021207p2.xml. Johnson, Nicholas L. “Preserving the Near-Earth Space Environment with Green Engineering and Operations”. 30 Sept.-1 Oct. 2009. Presentation. NASA Green Engineering Masters Forum. 3 Nov. 2009. http://ntrs.nasa.gov/archive/nasa/casi.ntrs.nasa.gov/20090032041_2009032577.pdf. “Space Debris: Orbiting Debris Threatens Sustainable Use of Outer Space”. 2008. United Nations. 10 Oct. 2009. http://www.un.org/en/events/tenstories/08/spacedebris.shtml. See, UN Doc. A/AC.105/820/Add.1 of 15 December 2003; UN Doc. A/AC.105/820/Add.1 of 4 February2004; Roscosmos. “Activity of Russian Federation on Space Debris Problem”. Presentation. 46th Session of the Scientific and Technical Subcommittee of UNCOPUOS. Vienna, Austria. 17 February 2009. 2 Nov. 2009. http://www.unoosa.org/pdf/pres/stsc2009/tech-46.pdf; Wirt, Uwe. “UN-Space Debris Mitigation Guidelines — National Implementation Mechanism.” Presentation. 48th Session of the Legal Subcommittee of UNCOPUOS. Vienna, Austria. 31 March 2009. 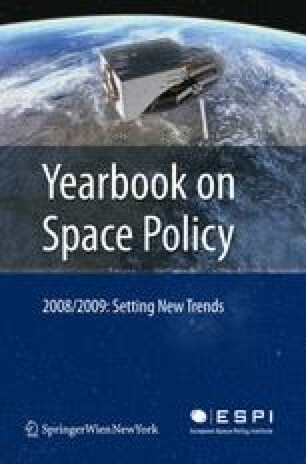 2 Nov. 2009. http://www.unoosa.org/pdf/pres/lsc2009/pres-06.pdf; Klinkrad, Heiner. “Space Debris Mitigation Activities at ESA”. Presentation. 46th Session of the Scientific and Technical Subcommittee of UNCOPUOS. Vienna, Austria. 17 February 2009. 2 Nov. 2009. http://www.unoosa.org/pdf/pres/ stsc2009/tech-40.pdf; NASA “USA Space Debris Environment and Policy Updates”. Presentation. 45th Session of the Scientific and Technical Subcommittee of UNCOPUOS. Vienna, Austria. 11-22 February 2008. 2 Nov. 2009. http://www.unoosa.org/pdf/pres/stsc2008/tech-26E.pdf. Marks, Paul. “Race is on for Best Space-junk Alarm System”. 22 July 2009. NewScientist. 23 July 2009. http://www.newscientist.com/article/mg20327185.800-race-is-on-for-best-spacejunk-alarm-system.html. Moltz, James Clay. “Space Jam”. 18 Feb. 2009. The New York Times. 19 Feb. 2009. http://www.nytimes.com/2009/02/19/opinion/19moltz.html?_r=1eta1. de Selding, Peter B. “Satellite Firms Moving Ahead on Orbital Database”. 11 Nov. 2009. Space News. 12 Nov. 2009. http://www.spacenews.com/satellite_telecom/091118-satellite-firms-moving-ahead-orbital-database.html. For details discussion of various aspects of Space Traffic Management, see Schrogl, Kai-Uwe. “Space Traffic Management. The New Comprehensive Approach for Regulating the Use of Outer Space: an International Perspective”. October 2007. ESPI Perspectives 3. 2 Sept. 2009. http://www.espi.or.at/images/stories/dokumente/flash_reports/stmflashrep3f2.pdf. “Space Collisions and Opportunity for Entrepreneurship”. 3 Aug. 2009. Spacetalk now 10 Aug. 2009. http://spacetalknow.org/wordpress/?p=740. Day, Michael. “Rogue Satellites to Be Cleared From Earth’s Orbit by German Robots”. 11 Oct. 2009. The Observer. 14 Oct. 2009. http://www.guardian.co.uk/science/2009/oct/11/space-robots-clear-rogue-satellites. “Space Debris Gets Some Respect”. 28 Sept. 2009. Spacemart. 2 Nov. 2009. http://www.space-mart.com/reports/Space_Debris_Gets_Some_Respect_999.html.